which you can also use as a cooler coat in the summer. 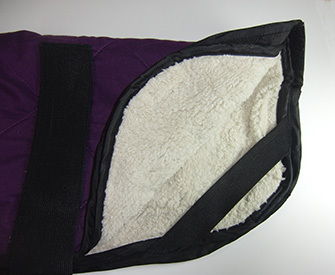 The coat is of the same quality as Australian dog owner uses as a coat for their dogs, but has been supplemented with a removable lightweight, very soft fleecy warm lining. 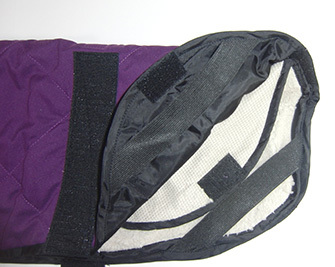 The lining is fastened with Velcro strap and is easily removed when needed. 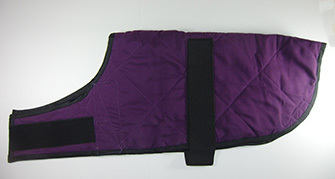 The coats have elastic bands on the inside of the thighs, which makes the coat suitable for the dog. Straight velcro strap under the stomach and over the chest that makes the length / depth very flexible. Under the stomach the Velcro strap is smooth to not get caught in the fur. The coat weighs "almost nothing" ... You can also use it as a rain coat as it does not give cooling effect if you do not drip it in cold water. It dries quickly. As a cooler coat, soak the blanket thoroughly in cold water and allow it to drain. Then keeps cooling for many hours. The fur does not get wet! Wash in 40 gr without detergent. Available only in purple color and the dimensions refer to the length on the back of the coat.